DFH is a great value. Huge props to the Toontrack team, as they've managed to decipher these complicated genres and do it in a way that provides lots of variety and complexity while retaining the human character of the performances. Just by reading down the list of Drumkit From Hell (DFH) credits, metalheads should start to salivate and throw up the horns and scream “I am not worthy!”. The DFH project lists the involvement of Daniel Bergstrand, Fredrik Thordendal and Mattias Eklund in the production (recording, engineering and mixing) and the performances and midi programming of Fredrik Thordendal and Tomas Haake of Meshuggah, Owe Lingvall of Nocturnal Rites, Mattias Grahn of Naglfar and Efraim Juntunen of Persuader. • Ludwig Wood Fiber Glass 24"
• Sonor Designer Series 10x10", 12x12", 13x13", 16x16" and 18x18"
The requirements for running DFH are a Windows XP SP3 or newer, Pentium 4 or Athlon processor with 512 MB RAM. On the Mac you'd need OS X 10.5 or higher, G5 or Intel processor with 512 MB RAM, 1 GB free hard disc space, DVD drive. In order to run DFH you also need a working EZdrummer® or Superior Drummer® 2.0 installation, as DFH is essentially a sound and midi library that runs on these engines. DFH is compatible with VST, Audio Units and RTAS plugin standards. Installation is fairly straightforward with a challenge/response scheme, same as described in our review of EZDrummer. After installation, when you fire EZDrummer in your DAW or in standalone mode, a new menu item called “Drumkit From Hell” shows up under the EZX dropdown menu. The kits that come as presets with DFH are Default Kit, Metal Kit, Thrash Kit, Death Kit and Basic Kit. I personally couldn't discern any genre differences, as the Death Kit could work just as well in thrash and vice versa. 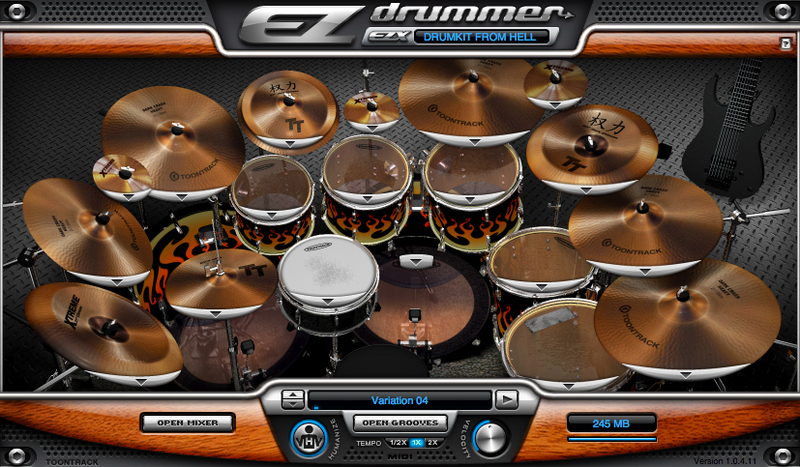 The midi performance files show up under two separate categories, listed under grooves: “EZX Drumkit from Hell” and “EZX Drumkit from Hell Guests”. The first one is the main library and the second category features the midi performance files from the featured guest drummers. Before DFH I had to program my own metal samples via either tapping them on a midi grid or using an Alesis SR-16 and a Boss DR 880 drum machines. All of these methods involved long hours and a lot of expletives coming from my studio room. I always felt that the programmed beats lacked some flair and felt rigid. In this case, DFH was a very welcome addition to my metal drum programming kit. DFH samples cut through any mix as they are very present and “in your face”, as what I would call more modern. These are not the 80s drum sounds of Megadeth, Sepultura, Metallica and so forth, but the dense and present modern sounds of bands like Arch Enemy, Meshuggah, Nevermore, Shadows Fall and the like. I would probably describe them as sounds that Andy Sneap would use. If you're looking for the more traditional, darker and more reverbant 80s sounds, this library would most likely not be for you, although the midi performance files would work for that style as long as you use different drum sounds, maybe the EZDrummer Rock library. With that in mind, I like most of the sounds in DFH but felt that the snares could use a bit more depth and bottom snare ring. The kit sounds are superb for modern metal production and work great in all metal genres. The performance files also cover a lot of metal real estate as there are slow Black Sabbath-like ballad dirge loops, lots of midtempo and fast double bass stuff that goes all the way to grindcore and the extreme death/black metal genres. I applied the sound library to a thrash/speed metal song I was working on with a real drummer, just to get a different flair and show him what I was looking for. Getting some of the stops and shots right on the money turned out to be a bit complicated as the DFH library didn't have many on hand Metal riffs are complex and vary widely in accents so I couldn't really blame the designers. For this I went back to my old approach. I plugged in a Boss Dr. Rhythm 880 drum machine via midi and recorded those hits live, then flew them into the DFH track. Once the DFH track was complete, the session drummer tracked midi drums on a Roland kit for the same song which we then triggered with DFH. Since EZDrummer uses the DM standard note map, the process was straightforward and it was actually a drag and drop, none of the midi notes needed to be changed. While not bad by any means, the drum performance that made the cut was DFH as the consistency and feel were better suited to the song. Needless to say, after we used the DFH samples instead of his, we are no longer on speaking terms with this particular drummer. That in itself should be a testimonial as the quality of the samples. No big surprise there as apparently Brandon Small (Dethklok) uses DFH for his tracks instead of a live drummer. I have to say that I am very impressed with the quality of sounds, as well as the variety of material featured in the DFH pack. At the current street price of $79.99, Drumkit From Hell should be a great deal for anyone that needs a good metal library.